Scientists from the University of Sheffield have identified new messenger molecules shuttled between cells which could help to protect the survival of neurones—potentially leading to new treatments for MND. The pioneering research has discovered the role of a small molecule which can regulate large signalling cascades and significantly improve the survival of neurones—something which will help pave the way to identify and develop new therapies for neurodegenerative diseases. MND, also known as Amyotrophic Lateral Sclerosis (ALS), is a devastating neurogenerative disorder that affects the nerves—motor neurones—in the brain and spinal cord that tell your muscles what to do. The messages from these nerves gradually stop reaching the muscles, leading them to weaken, stiffen and eventually waste. The progressive disease affects a patient's ability to walk, talk, eat and breathe. MND affects 5,000 adults in the UK and there is currently no cure. Approximately 10 per cent of MND cases are inherited but the remaining 90 per cent of MND cases are caused by complex genetic and environmental interactions which are currently not well understood—this is known as sporadic MND. The most common known genetic cause of MND is a mutation of the C9orf72 gene. Although MND affects the survival of neurones, other supporting cell types such as astrocytes—star-shaped glial cells in the brain and spinal cord—play an important role in the progression of the disease. Normally responsible for keeping the neurones protected and nourished, astrocytes can become toxic in MND. In a healthy organism, these cells release pockets of vesicles containing messages to communicate with other cells. In MND, these extracellular vesicles (EVs) can contain toxic factors—no longer supporting the neurones but instead contributing to their death. The new research, led by Dr. Laura Ferraiuolo from the University of Sheffield's Insitute of Translational Neuroscience (SITraN) found that when the micro-RNA molecule—which can regulate large signalling cascades—is introduced to an astrocyte-motor neurone culture, the survival of neurones was significantly improved. The micro-RNA identified in the study, called miR-494-3p, regulates genes involved in maintaining the health and strength of neurones axons. Researchers also found miR-494-3p was significantly depleted in cells derived from patitents with sporadic MND. 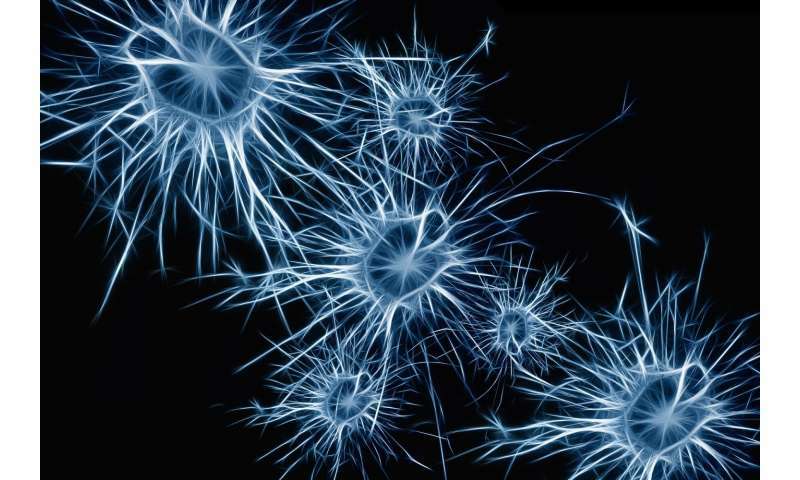 Dr. Ferraiuolo from SITraN and lead author of the study said: "When an artificial form of miR-494-3 was introduced to the astrocyte-motor neuron culture, the survival of neurons was significantly improved. "The study shows that restoring depleted micro-RNAs can improve cell survival. The results not only shed more light on the mechanisms of this complex disease, but they hold massive potential for the identification and development of new therapies for ALS and other neurodegenerative diseases." The research, in collaboration with Dr. Guillaume Hautbergue's team at SITraN and Dr. Stuart Hunt's lab in the University of Sheffield's Dental School, is published in the Journal EBioMedicine (published by The Lancet).